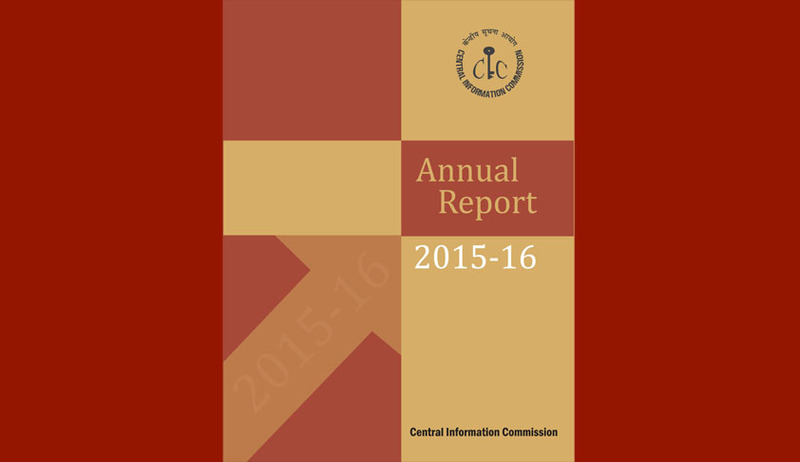 The Central Information Commission has published the Annual Report for 2015-16 regarding the implementation of The Right to Information Act, 2005 (RTI Act). The Annual Report (AR) has come under critical scrutiny in the hands of activists and observers. Here is a summary of trends observed by Venkatesh Nayak of Commonwealth Human Rights Initiative, New Delhi. 1) During the reporting year 2015-16 9.76 lakh RTI applications were received by the registered public authorities (PAs). This is 2.21 lakhs or 22.67% more RTI applications received than what was reported during 2014-15. However in 2014-15 almost a quarter of the registered PAs failed to submit their RTI data.. Only 75.27% of the PAs reported their RTI data to the CIC. So the data for 2015-16 indicates that the number of RTIs filed with the PAs in Central Government continues to display a plateauing trend this year as well with no significant hike in the numbers. However the CIC reports that RTI applications have increased by 3.8% in 2015-16 as compared to the previous year. 2) According to the CIC the PAs rejected 6.62% of the RTI applications processed during 2015-16. This seems to have come down by 1.77% from the high of 8.39% reported in 2014-15. Nevertheless the figure for 2015-16 is much higher than the lowest proportion of rejection recorded in 2010-2011 at 5.10%. However the downward trend in 2015-16 appears to be a positive development. 3) According to the CIC, the highest proportion of RTI applications was rejected not under the permissible exemptions under the RTI Act such as Sections 8, 9, 11 or 24 but under the mysterious category of "others". At 43% rejections recorded under this category, more than 4 out of every 10 RTI applications rejected were for reasons other than those permitted by the RTI Act. The Prime Minister's Office is one of the PAs that employed this device very frequently . 4) 47% of the 9.76 lakh RTIs were rejected under various clauses in Section 8 of the RTI Act. 1% of the RTIs were rejected under Section 9 (private copyright) and 7% of the RTI were rejected by the 26 security and intelligence organisations partially excluded under Section 24 of the RTI Act. 5) The CIC has reported that there is a decrease in the number of first appeals received but increase in the number disposed by the first appellate authorities. While this is a new positive trend, it requires deeper analysis because in previous years the proportion of first appeals has often been higher than the proportion of rejections. 6) The CIC disposed of 28,188 appeal and complaints cases in 2015-16 while 25,960 cases were registered during the same period. Pendency of second appeals and complaints on 01 April, 2016 was a whopping 34,982 cases. 7) The CIC reports that it imposed penalties to the tune of Rs. 10.52 lakhs out of which Rs. 9.41 lakhs was paid up by the PIOs. Penalties worth Rs. 1.25 lakhs imposed in various cases have been stayed by various High Courts. 8) The CIC has reported that the amount of fees and penalties reported by the PAs has increased by 12.31% in 2015-16. However if the amount of penalty imposed is reduced from this figure, the amount of fees collected by various PAs has actually come down from Rs. 1.14 crores in 2014-15 to Rs. 1.07 crores in 2016-17. This trend seems to be at variance with the reduction in the proportion of rejections. This is because, if more people received information then logic dictates that the proportion of fees collected ought to have gone up. This would have to be the case unless the PAs have started the practice of giving information free of charge to RTI applicants. This new trend requires deeper examination. 9) The number of Public Authorities registering with the CIC for submitting their RTI statistics is 1,903 - much lower than the highest figure of 2,333 registered in 2012-13. More than 400 public authorities did not register with the CIC despite its perseverant efforts in 2015-16. However, the AR states that reporting compliance from amongst the registered public authorities is the highest during the last 12 years at more than 94%. This is a good sign. However, the report does not throw light on the names of public authorities that did not register with the CIC. This could have been done by comparing with the data from 2012-13. 10) The Ministry of Drinking Water and Sanitation and Ministry Overseas Indian Affairs have not reported their RTI statistics despite registering with the CIC. Only 33% of the public authorities from the Ministry of Road Transport and Highways reported their RTI data to the CIC. However compliance has been between 60-100% in a large number of Ministries and Departments that have registered with the CIC. 1) While the President's Secretariat received only 123 more RTIs in 2015-16 as compared to the previous year the proportion of rejection plummeted from 9.30% to 1.2% in 2015-16. This appears to be a very significant positive trend indicating higher proportion of information disclosure. 2) In 2015-16 the Prime Minister's Office (PMO) reported a rejection rate of 20.10% of the RTIs received. This is a significant drop from 22.10% in 2014-15. However only 7 RTI applications were rejected by the PMO invoking Section 8. A whopping 2,227 RTIs were rejected in the "Others" category. However rejections in this category were much higher at 2,781 in 2014-15. This declining but nevertheless worrisome trend requires in-depth study. 3) The proportion of rejection of RTIs by the Supreme Court fell to 21.1% in 2015-16 while it received only 6 more RTIs as compared to the previous year. The proportion of rejections by the Delhi High Court also registered a fall of more than 1% in 2015-16 even though the number of RTI applications received went up by 127. 4) While the number of RTIs received by the Comptroller and Auditor General fell to 716 in 2015-16 from 796 the previous year, the proportion of rejection zoomed to 17.2% from 6.3% reported the previous year. This alarming increase requires in-depth study. 5) The proportion of rejection of RTIs by the Election Commission of India has remained at steady state at 0.1% despite receiving 539 fewer RTIs in 2015-16. 6) The Cabinet Secretariat also witnessed a jump in the proportion of rejections from 4.30% to 6.65% in 2015-16 although it received only 73 more RTIs. 7) The Ministry of Personnel and Training reported a significant decline in the proportion of rejections at 3.4% in 2015-16 as compared to 9.4% during the previous year even though it reported receiving 9,000 more RTIs in 2015-16. This appears to be a positive trend. 8) Although Delhi Police received 648 more RTIs in 2015-16, the proportion of rejection fell slightly by 0.4% in 2015-16. 9) Among key Ministries, the proportion of rejection in the Ministry of Defence fell significantly to 11.5% in 2015-16 as compared to 15.90% the previous year. In the Ministry of Finance which has 212 PAs reporting (banks and tax authorities), the proportion of rejection fell to 18.30% in 2015-16 as compared with the 20.20% rejection rate the previous year. The Ministry of External Affairs also reported a fall in the proportion of rejection at 5.74% in 2015-16 as compared to the 7% rejection rate reported the previous year. However, the proportion of rejection in the Home Ministry increased slightly by 0.1% in 2015-16 even though it received 1,143 more RTIs in 2015-16.